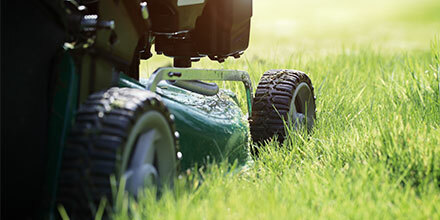 Keeping It Healthy: Mowing and Grass Cutting for Spring, Summer, Autumn and Winter. Cut at a slightly higher height and then gradually take the lawn down over a few cuttings in the growing season. Continue to mow at that height throughout Summer. For the last cut choose the right height and do not be tempted to give it one last good cut as it puts the grass under stress as it heads into Winter. Once a week is good during peak growing time April to October. Depends on the height you want to keep it at and the weather. Less cutting is needed as the grass will already be stressed in these conditions. The longer leaf blades will help shelter the base of the plant from the heat. A blunt blade tears grass rather than cuts it. Blunt blades on a new lawn tend to rip the plants out. Ragged blades of grass let in disease and may leave the tips yellow.